UPDATE (1/15/2013): Cliff Ragsdale was kind enough to include the modification I describe below in the 7th edition of his book (it’s now problem 32 in Chapter 6). He even named a character after me! Thanks, Cliff! When I teach the OR class to MBA students, I adopt Cliff Ragsdale’s textbook entitled “Spreadsheet Modeling and Decision Analysis“, which is now in its sixth edition. I like this book and I’m used to teaching with it. In addition, it has a large and diverse collection of interesting exercises/problems that I use both as homework problems and as inspiration for exam questions. The population in regions 1, 2, 3, 4, and 5 are estimated as 45,000, 65,000, 28,000, 52,000, and 43,000, respectively. In which two regions should the ambulances be placed? It’s easy for students to eyeball an optimal solution. So they come back to my office and say: “I don’t know what the point of this problem is; the answer is obviously equal to …” Many of them don’t even try to create a math model. It’s not as easy to eyeball an optimal solution as it was before. If you write a model assuming every region has to be covered (which is not a requirement to begin with), you’ll get an infeasible model. In the original case, this doesn’t happen. I didn’t like that because this isn’t an explicit assumption and many students would add it in. If you pick the wrong set of variables and double-count the number of people covered, you’ll end up with an incorrect (sub-optimal) solution. 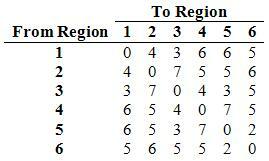 The new population numbers (in 1000’s) for regions 1 through 6 are, respectively, 21, 35, 15, 60, 20, and 37. I am now much happier with this problem and my students are getting a lot more out of it (I think). At least I can tell you one thing: they’re spending a lot more time thinking about it and asking me intelligent questions. Isn’t that the whole purpose of homework? Maybe they hate me a bit more now, but I don’t mind practicing some tough love. Feel free to use my modification if you wish. I’d love to see it included in the 7th edition of Cliff’s book. Note to instructors: if you want to have the solution to the new version of the problem, including the Excel model, just drop me a line: tallys at miami dot edu. Note to students: to preserve the usefulness of this problem, I cannot provide you with the solution, but if you become an MBA student at the University of Miami, I’ll give you some hints. Today I’m going to write about a decision that’s made by many American families each year: how to pick summer camps for our kids. There are several issues to take into account, such as cost, benefit, hours, and kids’ preferences. I’ll introduce an optimization model for summer camp selection through a numerical example. The example portrays a large family, but the same ideas apply if a few smaller families want to get together and solve this problem. This way they can take advantage of the discounts and take turns driving the kids around. The Joneses have six kids: Amy, Beth, Cathy, David, Earl and Fred (yes, their first names are alphabetically sorted, matching their increasing order of age; Mr. and Mrs. Jones always knew they’d have six kids and hence named their firstborn with an ‘F’ name). This year, they’ve narrowed down their list of potential summer camps to the following ten: Math, Chess, Nature, Crafts, Cooking, Gymnastics, Soccer, Tennis, Diving, and Fishing. The Nature camp takes kids on a hike through the woods with the guidance of a biologist; they make frequent stops upon encountering specific plants and animals, during which a mini science lecture is delivered (pretty cool!). The Cooking camp involves cooking chemistry instruction, à la Alton Brown (also pretty cool). 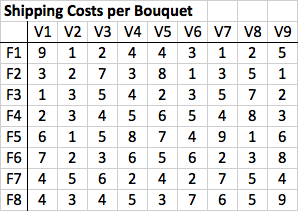 The Cost column indicates the cost per child. The Discount column indicates the percentage discount that each child enrolled after the first would receive on the cost of each camp. For instance, if three children are enrolled in Math camp, the first would cost $1100, and the second and third would cost $770 each (30% less). The Hours column is self-explanatory and the last two columns indicate whether or not that particular camp develops mental and physical abilities, respectively (a value of one = yes, zero=no). For example, the Joneses want Fred to attend at least 3 camps that develop mental abilities, and at least 1 camp that develops physical abilities. The last two columns in the above table indicate the minimum and maximum number of camp hours for each child over the 9-week summer break. The smaller the number in the above table, the more desirable a particular camp is. For example, Amy is a bit of a math nerd, and if we were to flip David’s preference scores for Math and Tennis, he could be classified as a bit of a jock. Some conflicts exist, in the sense that not all camps are compatible with each other in terms of time schedules. In this particular case, let’s assume that no child can attend both the Soccer and Tennis camps, or both the Nature and Soccer camps. Here’s how we are going to use this preference table to create a sense of fairness among the children: whenever a child that prefers camp X to camp Y goes to camp Y and doesn’t go to camp X, nobody else gets to go to camp X either. For example, if Amy goes to Nature camp and isn’t sent to either Math or Chess camp, none of her siblings are allowed to go to Math or Chess either. Conversely, if the Joneses decide to send Earl to Chess camp and Fred to Tennis camp, they must also send Earl to Tennis camp (because Earl prefers Tennis to Chess, and “Fred is going! Why can’t I go too!”). Clearly, there are other ways to use/interpret this table, such as trying to send everyone to at least one of their top N choices, but we won’t consider those alternatives here. Depending on your own requirements, preferences, and costs your solution may differ, of course. But this should give you an idea of how this simple problem can easily become very complicated to solve. No need to fear, though! Operations Research is here! Food for Thought: Here’s an interesting question that helps illustrate how high-quality solutions can be counterintuitive: by looking at the preferences table, we see that everyone prefers Soccer to Tennis. In addition, Soccer camp is less expensive than Tennis camp. So how come we send almost everyone to Tennis camp? Isn’t that strange? Let me know what you think in the comments below! That’s one of the advantages of using an analytical approach to decision making: it helps us find solutions we wouldn’t even consider otherwise because they don’t seem to make sense (at least not at first). If you’re curious about how I managed to find the optimal solution, read on! To find the minimum-cost solution, we can create a mathematical representation of the problem, a.k.a. a model, and then solve this model with the help of a computer. Let’s see how. The first obvious decision to make is who goes where. So let the binary variable equal when child goes to camp , and equal to otherwise. We’ll also need another binary variable that is equal to when at least one child goes to camp and equal to when none of the children go to camp . We are now ready to write our objective function and constraints. I’ll refer to the problem data using the column headings of the tables above. The subscript will always refer to a child, and the subscript will always refer to a camp. Note how we are using the variable to handle the discount for sending more than one child to camp : we charge every child the discounted price in the double summation and add the discount back in only once if . And that’s the end of our model. Here’s a representation of this mathematical model in AMPL in case you want to play with it yourself. This is the model I used to obtain the numerical results reported above. Enjoy! Raj wants to dip the hazelnuts into liquor, but that’s not in the budget, so he gives up. Leonard reminds everyone that, because of their allergies, it’s important to keep the average allergenicity level per pound in both mixes to no more than 3. Write an optimization model to help Penny prepare the two kinds of snacks at minimum cost. 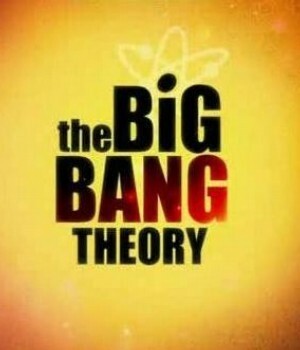 But be careful: Sheldon will check it later for correctness! This post is part of my series “Having Fun with Exam Questions”. Previous questions dealt with Farmville, vampires, and (potentially) Valentine’s day.